The Washington Lions Club sponsored the GOOD Program at Belle Aire Intermediate School given by motivational speaker Ron Derry. He delivered his message to all fourth graders and challenged them to do their best and not give up. Derry, formerly a teacher and coach, lost his eyesight years ago. He has since dedicated his life to bring this message to students.Pictured (L to R): front row: Addison Yahn and Kaden Matson. Back row: Ron Derry, Sarah Cochenour, Ray Deeks from the Lions Club and Jay Haines. 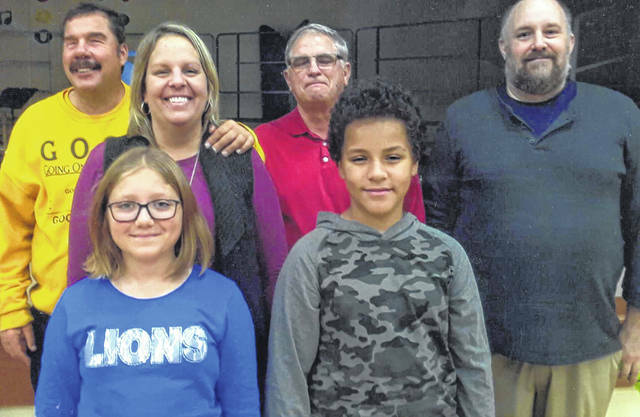 https://www.recordherald.com/wp-content/uploads/sites/27/2018/11/web1_img088.jpgThe Washington Lions Club sponsored the GOOD Program at Belle Aire Intermediate School given by motivational speaker Ron Derry. He delivered his message to all fourth graders and challenged them to do their best and not give up. Derry, formerly a teacher and coach, lost his eyesight years ago. He has since dedicated his life to bring this message to students.Pictured (L to R): front row: Addison Yahn and Kaden Matson. Back row: Ron Derry, Sarah Cochenour, Ray Deeks from the Lions Club and Jay Haines.